The Statue of Zeus was built in honor of the Greek King of Gods, Zeus. During ancient times much like modern times people from all over world travel to Greece to compete in Olympic Games. When the Olympic Games were started in 776 B.C. there was a smaller monument to honor Zeus. As the Olympic Games grew it was decided that a new shrine should be constructed, between 470 and 460 B.C. Libon of Ellis created the Temple of Zeus and it was finished in 456 B.C. As time went on it was believed that the Greek people thought the temple was too simple, so they wanted a statue constructed of Zeus as well. Phidias, who constructed the statue of Athena in the Parthenon, was chosen to construct this statue. The Statue of Zeus at Olympia would become known as one of the Seven Wonders of the World. At the end of this lesson students will have expanded their knowledge on Greek mythology, the Olympic Games, and the country of Greece. This lesson is not based on lecture alone but students will also learn through hands on activities. This story follows two children with their tree house as they enter the world of ancient Greece to attend the ancient Olympic Games. Students will be introduced to ancient Greek mythology and beliefs including names of Gods and Goddesses. 2. 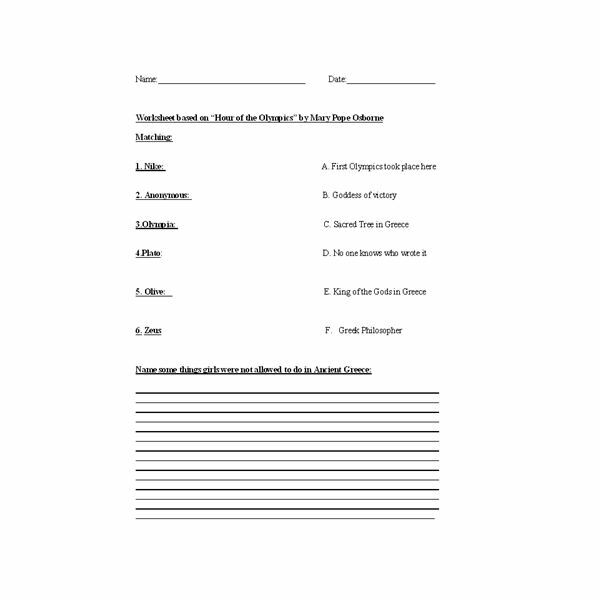 Have the students complete matching worksheet below, which is based on the book. 3. Show students where Greece is located on the map. Explain that Greece is located on one of the seven continents, Europe. A free outline of Greece can be found here. With this outline you can all students to fill in the map of Greece and draw what they think to be the main cities, sites, rivers, etc. This activity helps students learn about mapping and geography. 4. Report: Students will choose one God or Goddess to write a short story on. Have some Gods, Goddesses, Greek Mythology books readily available in the classroom for this writing prompt. Have children look over what their chosen God or Goddess did or was known for and have them write their very own short myth about them. 5. Homework Project: This next activity will help the students expand on the imagination and creativity. The students will be asked to construct their own mini temple or statue of the God or Goddess they chose to do the write about in the previous report. Have students make dioramas and allow them to use whatever material they want (crayons, paint, foam, miniature dolls, construction paper, etc) to construct their very own “shrine" to one the Gods or Goddesses. For extra points ask them to research architecture in ancient Greece (Doric) to help them explain the layout. When student presents the project to the class extra points will be given for explaining why they chose the architectural layout or construction as having to do with Ancient Greece.